Last week and this week in training, we had fun with functional body weight exercises that also focused on core strength. 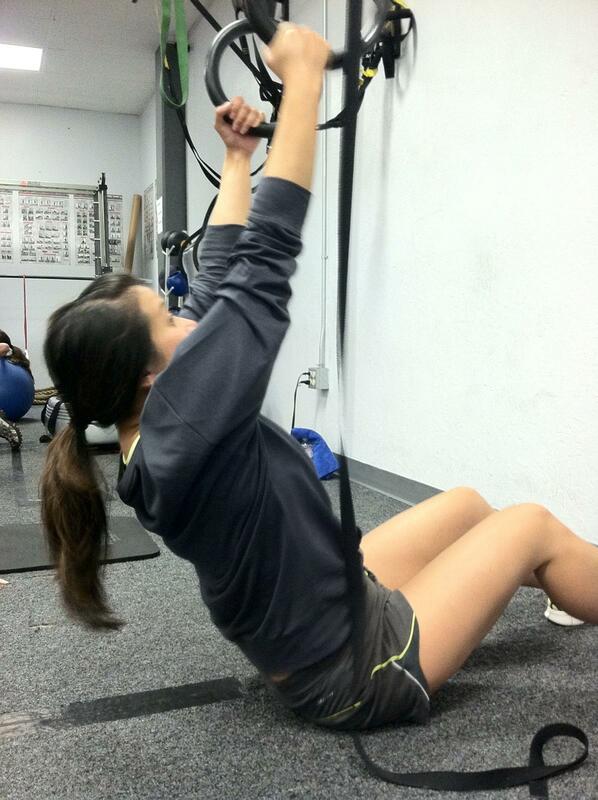 Rings and Swiss balls are two mediums that require your core to engage in order to remain stable during the movement. To get the full effect of engagement of our cores, my trainer incorporated hanging rings and a water filled tube for some of the exercises. Using the rings and the tube forced us to focus on our technique and brought us an awareness of our core. 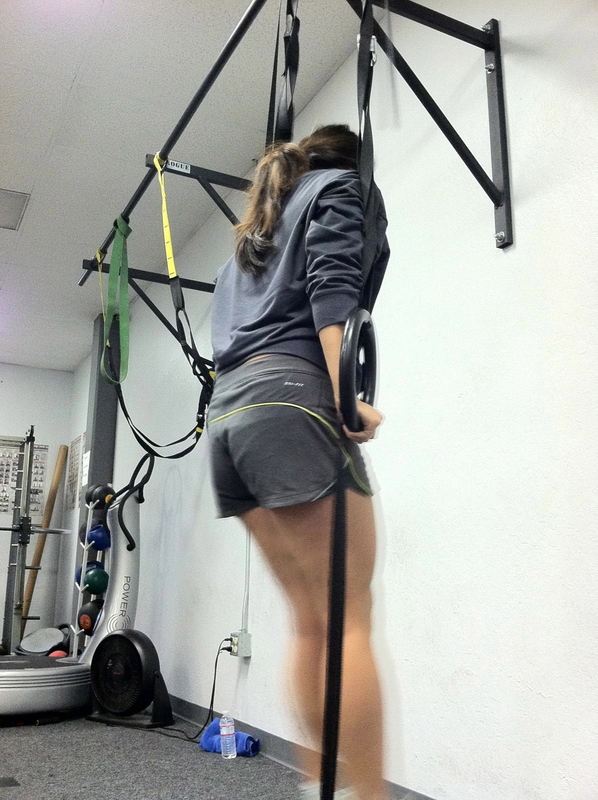 Muscle ups are one of the toughest CrossFit exercises to master. It requires precise technique and strength. For beginners, this is an excellent exercise to work your lats, triceps, and core. I break out the exercise into two parts... partly because the middle part (the transition) is difficult :) The first part is the row (pictured above). Position yourself under the rings so that your chest is underneath the rings. Row your body up to the rings. Think of being in an upside down push-up position. Then the transition into the dip position... Use your core to bring yourself upright as you swing your legs back. You can also use a small hop to get yourself into the upright position until you get the transition part down. 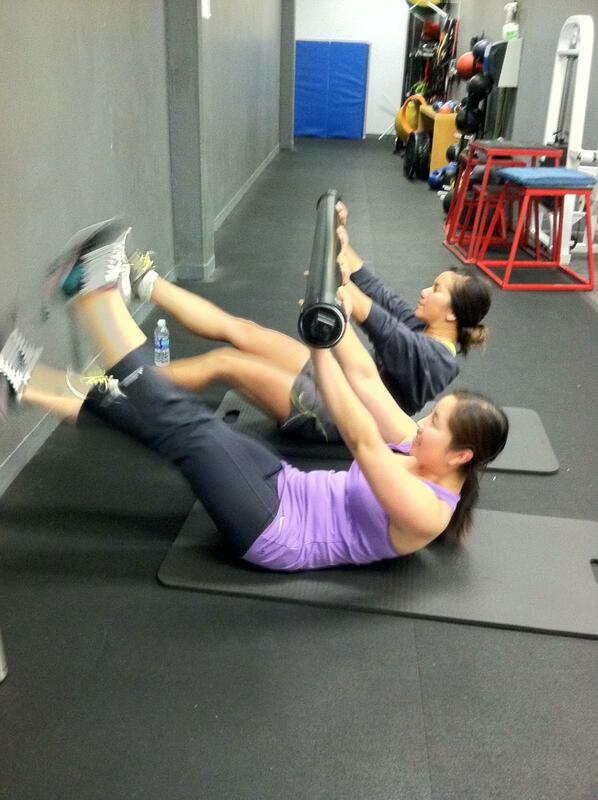 I am not sure when this water tube appeared at the gym, but it's been incorporated into a lot of our ab routines. The tube is filled about 3/4's of the way with water. The swishing water inside requires your core to constantly work. You can modify your scissor kicks by doing them in the crunch position. This will work your upper and mid-abs too. In lieu of the water tube, you can use a medicine ball or dumbbell. For this exercise, you do a regular sit and press the tube up as you come up. You can do this exercise with a medicine ball or with a dumbbell to add resistance. What techniques do you use to engage your core just a little more in your exercises?